Here i will show you how to create a RGB music controller, which lights RGB leds to music. I also added an AGC(Automatic gain control), which keeps the voltage at the same level. This is very useful, because you often play music at different volumes, and without the AGC, the leds will be very bright at high volumes, and be really dim at low volumes. Since the AGC automatically keeps the voltage at the same level, the leds will stay at the same brightness no matter what volume you're playing at. I created a circuit board using ISIS/ARES, but you could create one on a breadboard. You also might need an amplifier, depending on your audio set-up. The AGC starts amplifying at around 20mV, so if you're playing on low volumes you might need and amplifier. My internal laptop sound card outputs around 5-10mV on low volumes, and 1V on high volumes. When you send a sound signal into the input of the AGC, it either amplifies it, or dampens it, so that the output voltage(controlled by potentiometer RV4) is always the same. It then goes through 3 audio filters, to separate low, mid and high frequencies. The leds are controlled by transistors which leads current from collector to emitter when there's 0.6V difference between base and emitter. The output of each of the audio filters are connected to their own transistor, so you get different led light, when there's different audio. Here I will show you how to make the AGC part. You need an OP-amp(U2:A), I used an Tl074, which needs +12V, GND and -12V, but you can use any OP-amp. I used a 10K pot to regulate the voltage out the AGC. I start with having an op-amp (U2:B) with a negative feedback loop from the output of the AGC to a potentiometer for the each of the three filters. The voltage then goes through each filter, and then to a transistor at the end driving the voltage to ground when it receives voltage. The potentiometers regulate the amplitude of the signal, which is useful if you for example want bass frequencies to light more than others. 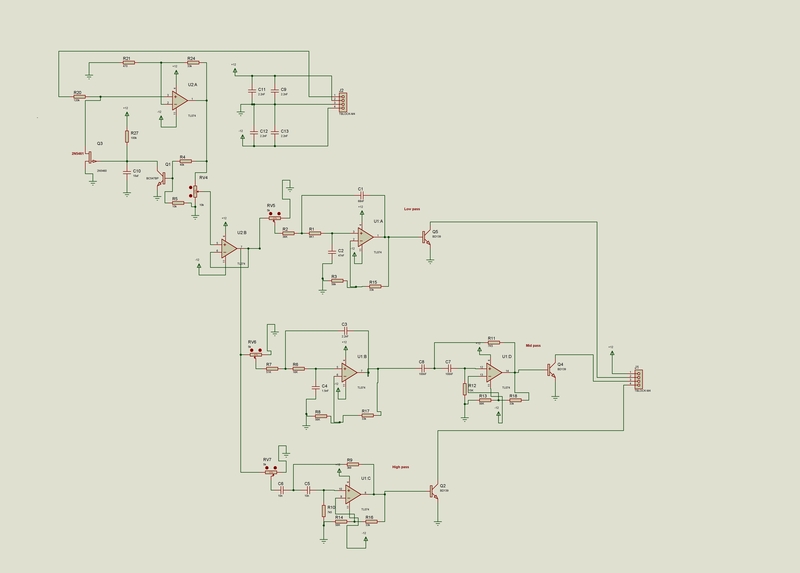 In my schematic I have the cut off frequency for low tones at around 200hz, the start for middle at around 250hz. Cut off frequency for mid tones is at around 2,3Khz and start for high tones at around 2,5Khz. I took my RGB music controller, and added it in a small box together with a power supply and an amplifier. I also added a speaker output, so that I can listen to music too. I connected red to low tones, green to mid and blue to high tones. I've added the ISIS/ARES files here, so you can download and print it for yourself if you have the things you need to print a circuit board. really great diy i'll defiantly do this with my leds!!!! I have a question about feeding your sound signal into the AGC. Could you explain that section a little more? What is the tblock-m4 you're using and the four capacitor system right at the beginning? Thank you! The four capacitors are just there to avoid rippel from the power supply. what is the maximum current for each channel?1A? This is really cool! I can see so many different applications for this! I'll let you know if I ever build anything with this.